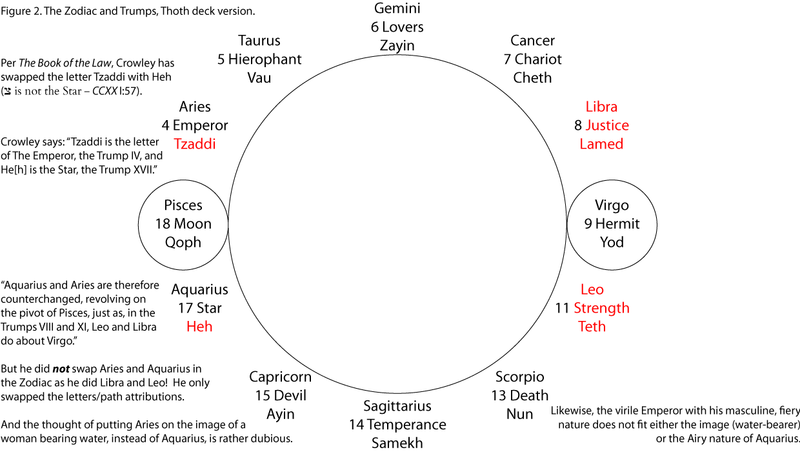 The verse in The Book of the Law where it’s mentioned that the Hebrew letter Tzaddi “is not the Star” led to Crowley doing some weird gymnastics with the Tarot trumps and their attributions. This was recently discussed on Reddit (in /r/thelema). Reddit user “Do_What_Thou_Wilt” has an excellent page with excruciating detail about Crowley’s solution and some of the confusion he perpetuates in The Book of Thoth itself. Now of course, if you’re not religious about every word in The Book of the Law – and, news flash, I myself am actually not, which is why I am at best a “small-Theta Thelemite” – then this is maybe less worrying. But it’s definitely something you should think about and come to a conclusion about, for yourself at least, when you’re working with the trumps and their correspondences. So I considered the problem. I thought about Crowley’s solution and came up with a slightly different one. Try to bear with me through the 4th “slide”: I think the discovery I have in that image is worth it. Enjoy. 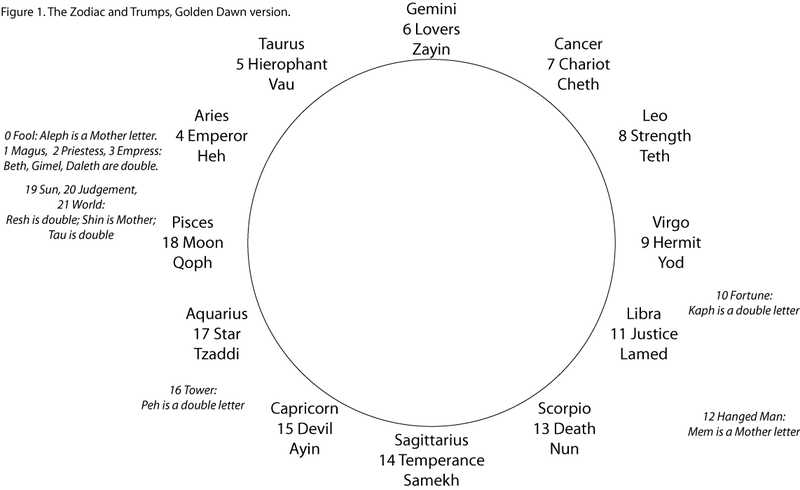 We start with the Golden Dawn’s attribution of the Trumps to the letters of the Hebrew Alphabet (read: the paths on the Tree of Life) and to the signs of the Zodiac. The Hebrew Alphabet is divided into three “Mother” letters, seven “double” letters, and twelve “single” letters. 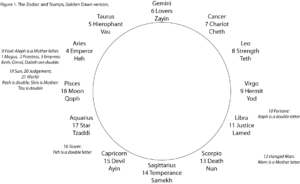 While all 22 letters correspond to a trump, only the 12 “single” letters and their trumps are attibuted to signs of the zodiac. The Golden Dawn themselves had flipped the traditional ordering of Justice and Strength, because “a figure with a pair of scales” (Justice) made sense as Libra (the scales), while “a figure with a lion” (Strength) made sense as Leo (the lion). 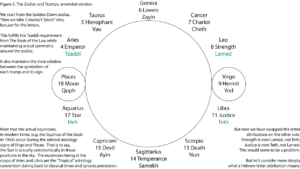 And since Leo comes after Cancer, Strength had to come betwee the Chariot and the Hermit; and similarly Justice had to come between the Hermit and Death (ignoring the Wheel of Fortune and the Hanged Man, since they are not zodiacal trumps). 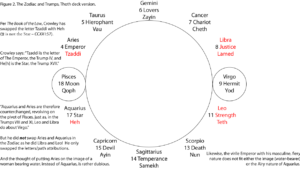 Crowley, in trying to get Tzaddi off the Star, decided that like the Golden Dawn “pivoted” two cards around Virgo, that he should pivot two cards around Pisces (at the opposite end of the wheel). But he didn’t pivot the whole cards, just their letter attributions. So we have this weird asymmetry. The signs Libra and Leo are now out of order, while Aquarius and Aries aren’t. He didn’t really pivot everything. Now surely the Golden Dawn is right: Leo should be with the card with a lion on it; Libra with the card with scales on it. But Aries belongs with the virile Emperor, and Aquarius certainly belongs with the figure on the Star with her pitchers of water. So let’s try something else: Let’s try just swapping the letters, but do that on both pairs. Uh-oh! 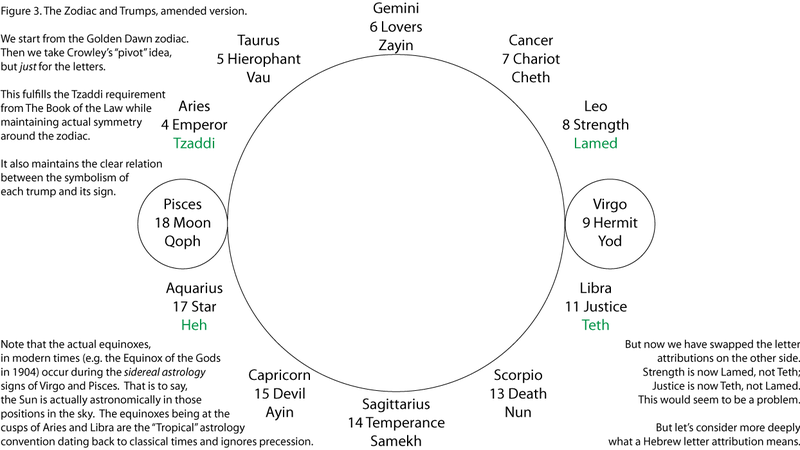 Now Leo / Strength is Lamed, and Libra / Justice is Teth. Can we do that? Does it make any sense? … So I think it does make sense. 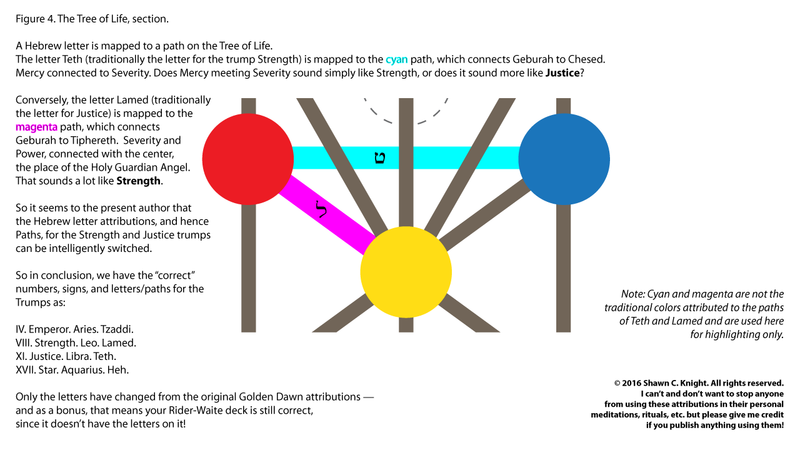 To see further evidence of this, I’m going to have to look at other things in Liber 777 and see if those cards make more sense connected with everything else in the tables. 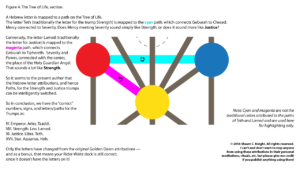 But considering only the Paths and their meaning in connecting the Sephiroth, the Zodiac signs, and the traditional images of the Trumps, I think (rather immodestly) that this is a better solution than Crowley’s, to a problem that he (or his HGA) created for himself.